So you think your old ant farm was cool. The Color of life gel ant habitat is the best around right now in my opinion. This clear gel unit can become any color with the ecer changing led base that is included. 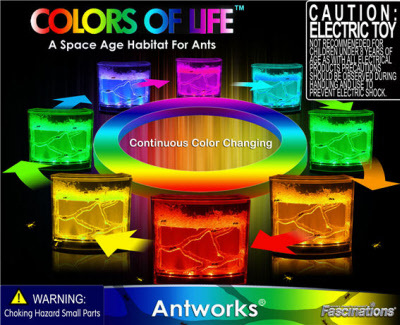 The Colors of life by fascinations is a once of kind Ant colony keeper. This kit comes with. Clear gel base Harvester Ant Habitat. Don't forget to purchase your live ants. We have them on sale right now!! Any questions on the colors of life Pleae email us.